Our product range includes a wide range of industrial ceramic fiber tapes and ceramic fiber wrapping tapes for insulation of chimney. 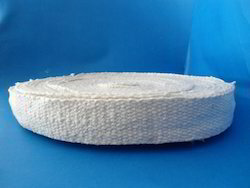 Industrial Ceramic Fiber Wrapping Tapes is a woven fabric made from our high quality ceramic fiber yarn. The ceramic tape is reinforced with fiberglass filament. Ceramic Fiber Wrapping Tapes is used for Insulation of Chimney. It is a woven fabric made from our high quality ceramic fiber yarn. The ceramic tape is reinforced with fiberglass filament with ss wire in metallic and non metallic grades for working temp upto 1000c for metallic and 600 for non metallic grades. Looking for Ceramic Fiber Tapes ?